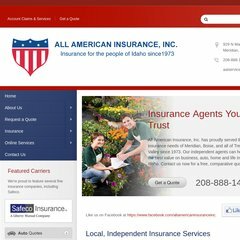 www.Aaillc.com - All American Insurance, Inc. Topics: Beginquote, Condobeginquote, and Rentbeginquote. It has 2 DNS records, ns63.worldnic.com, and ns64.worldnic.com. It is hosted by Avelient.com Texas, using Apache/2 web server. The site is programmed for PHP/5.2.17. PING www. (173.203.14.210) 56(84) bytes of data.